My first Ironman was a whirlwind experience. It has taken nearly two weeks for me to find time and energy to even attempt to write about it here. This post is horribly long, sorry. If you missed my post about race weekend leading up to Boulder, you can find that here. If you want to skip all the reading and just check out my official raceday photos, click here. Race morning- I was really thankful to have a hotel in Boulder so I didn’t have to wake up too early, 4 AM was my alarm time. I got dressed and had breakfast of two pieces of bread with tons of peanut butter on each and a banana. It is really hard for me to convince myself to eat early in the morning, so just getting this down was an accomplishment. 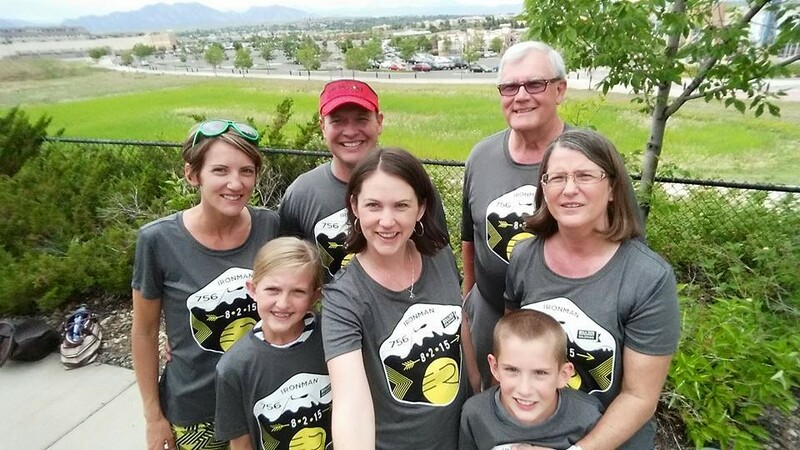 I had everything I would need that morning laid out the night before so it was really just a matter of getting dressed, eating and heading to Boulder High School where I would drop off my special needs bags and board a bus to Boulder Reservoir. 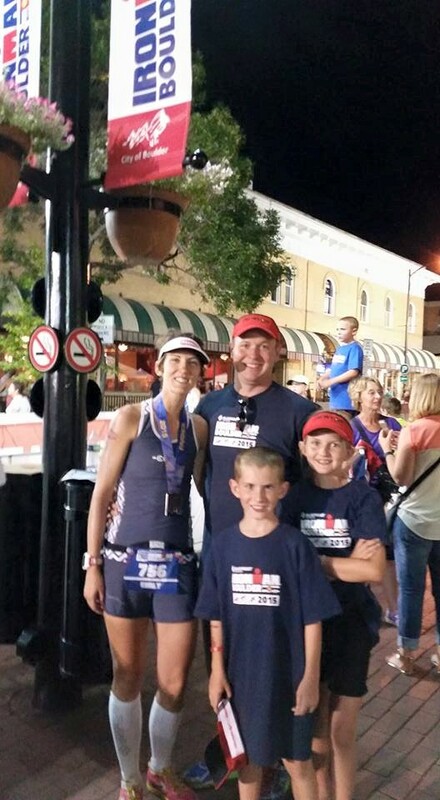 Knowing what a long day it would be for my spectators, I encouraged everyone to skip the swim and see me on the bike. My husband dropped me off at Boulder High School, wished me luck and went back to the hotel to relax for a bit. I wanted to add nutrition to my T2 bag that I had dropped off the night before so I made that my first stop in the morning, then walked to drop off my special needs bags. Again, more walking than I anticipated and I noticed I was already starting to feel hungry. As I waited in line for the bus, I questioned my decision to send my husband back to the hotel room, my nerves were high and everyone around seemed to have a group of people so I didn’t really chit chat with anyone. A school bus took us from Boulder High School to Boulder Reservoir, which was probably a 10 minute drive. Getting off the bus, at Boulder Reservoir, you entered a huge sea of people. Athletes, spectators and volunteers were everywhere!! At this point I had about an hour before the race would begin. I made the decision to stop at the first porta potty I saw, figuring the ones closer to the bikes would be very busy, even the wait at this one took probably 5 minutes. From there I made my way to the bike racks and T1 area. It was a crazy crowd of people and took a very long time to get anywhere. As I made my way to the entrance to T1, along with hundreds of other people, a volunteer or staff person was standing at the entrance turning away anyone who didn’t have body marking yet. This individual instructed quite a few of us where to go for body marking and we again entered the sardine can to barely move to get to body marking. Unfortunately the instructions given were not correct, so we made a left turn when a right hand turn should have been made. Body marking was at the top of a hill that was hard to get to once you were in the wrong place. Lots of barriers had been set up to keep people from going through, but it also made it nearly impossible for us to get where we needed. Add to that extremely slow moving because you couldn’t just walk past the hundreds of people. After lots of slow moving and a few more turns, I finally made it to the top of the hill. Asking at the volunteer tent where to go for body marking, no one knew. Eventually I was able to get to body marking and knew that TONS of time had been wasted by now and the rest of my pre-race would be chaos. Again, getting from body marking back into transition was a very slow process. I was finally getting to the bike racks as they were telling everyone to line up. I found a volunteer who quickly aired up my tires, I unpacked some nutrition for my bike and quickly got into my wetsuit. As this was happening they were already doing the national anthem. 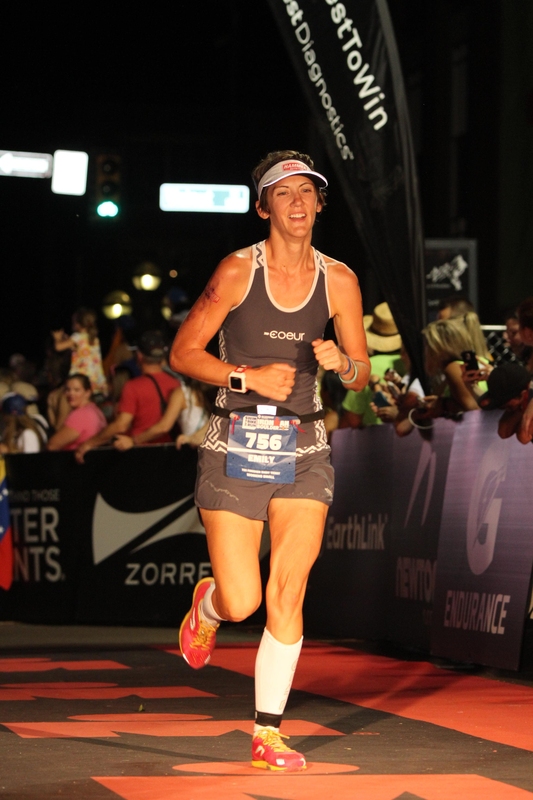 I quickly put on some body glide, grabbed my cap and goggles and made my way out of transition and to the masses of people lining up. I made it to the masses just as the first group of swimmers was going off. I ended up having a few minutes before I would actually get in the water, but this was a very hectic morning. That makes two races in a row that have been like this for me. Next time, I’m one of those crazy people who gets there way too early. Boulder Reservoir had played games with everyone on the temperature in the weeks leading up to the race. Two days before the race the temperature was low enough to be wetsuits for all. Race morning it was announced that it would be a wetsuit optional swim. 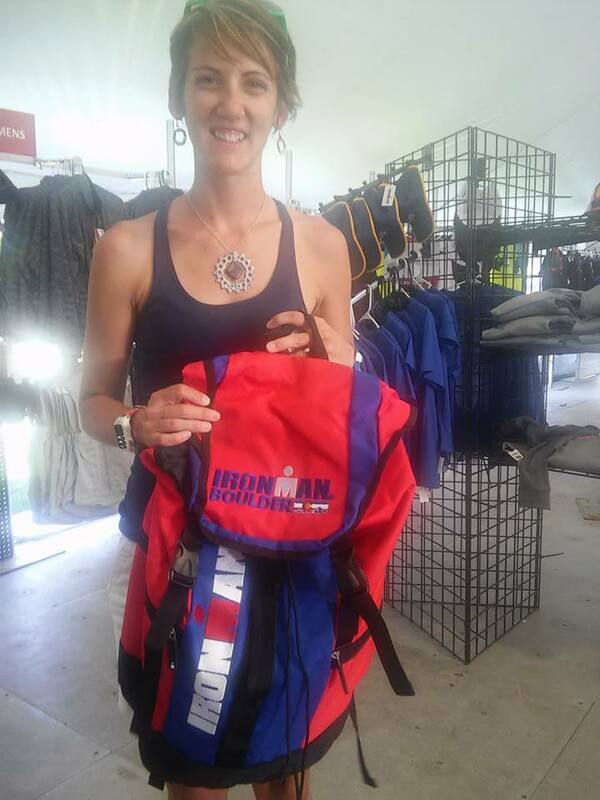 This meant that in order to receive Age Group Awards or a Kona slot, you had to forego the wetsuit. I knew that I wouldn’t be in the running for either of those that day, so I opted to still wear one. In my previous triathlons I had worn a full sleeve Zoot wetsuit. 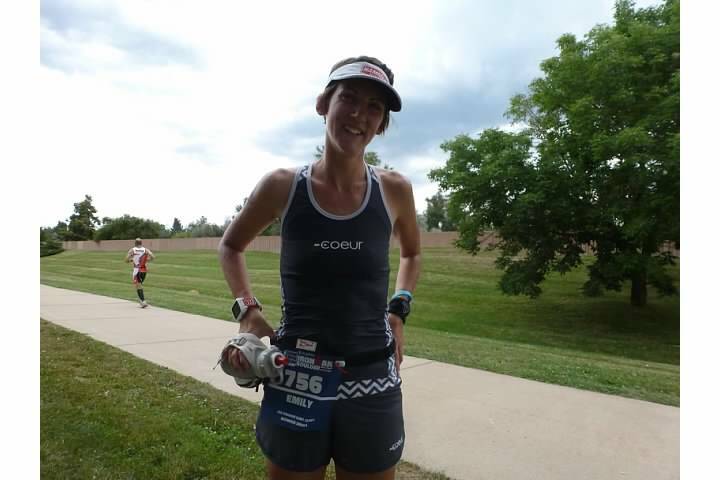 A month before Boulder it was clear that water temps could go either way, when I came across a great deal ($85!) on a sleeveless Xterra Wetsuit I went for it. Unfortunately I hadn’t gotten to practice in it at all before raceday. It ended up working great and I’m glad I had sleeveless because I think a full sleeve would have been too hot, however, my rushed Body Glide application in the morning was not as thorough as I’d hoped, even before the halfway point of the swim I could feel the wetsuit rubbing the back of my neck raw. Because of the wetsuit optional race, anyone in a non-wetsuit started in waves before anyone in a wetsuit. I would say a very good percentage of people still chose to wear the wetsuit, so the mass wetsuit start was chaos. It was a very crowded swim, while there was no elbowing or pulling legs that I experienced, there were quite a few times where someone was aggressively passing and crowding in a bad way as they did so. A few times I swam more to the outside just to get some space to find a rhythm. I reminded myself throughout to stay calm, stretch my stroke and just enjoy the experience. I must say, it was really amazing to see mountains every time you breath on the swim. Maybe I can convince my local pool to at least put nice pictures up on the walls? Overall the swim was good to me. I remained focused and relaxed and just enjoyed the experience. Thanks to my bike crash and sore should the month leading up to the race didn’t have many long swims. As the swim drew on I got anxious to be done, but never had a problem with feeling tired or any problems, I just was ready to be done swimming. 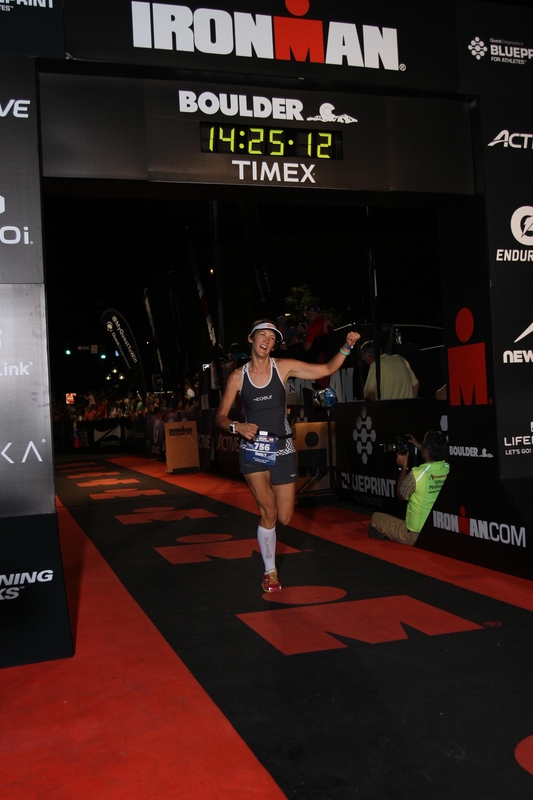 T1- This was my first Ironman transition experience. It was really nice to have so many volunteers around to help you. I didn’t rush through the transition, just wanted to make sure I had everything situated after how crazy my pre-race was. Unexpected highlight of T1 was the volunteer who got my bike off of the bike rack for me before I even got to it. I didn’t know they did that! The bike course was three loops. The first loop would be repeated a second time, then the third loop took you a completely different direction. Since we drove the course on Friday I had a decent idea of what to expect. The bike was the part of the race I was most nervous about since I hadn’t done a ton of riding since my crash. Prior to the race I worried about being undertrained and also the fear of crashing again was still there every time I rode. On raceday these both proved to be non-issues. The first loop I concentrated on an even effort somewhere between easy and moderate. 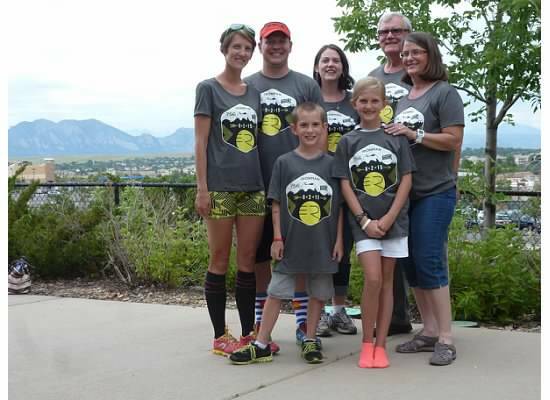 My parents, sister and daughter were at one spot on the bike course and my husband and son were at a separate point. What this translated to was seeing family at 3 spots each of the first two loops which really helped and gave me something to look forward to. This part of the course was really fun. There were some false flats, and a climb that lasted a few miles, but the downhill parts were just plain fun. They weren’t so steep that I was completely scared (there were still times where I chickened out and braked), but they made for some really enjoyable riding. Loop one was coming to a close and I was feeling great about the ride. Grace was a great cheerleader- cowbells, signs and yelling for me! Loop 2 I started to feel myself tiring on a false flat. I knew I shouldn’t be tired yet, so I backed off my effort a bit. At mile 54 I stopped at the aid station to refill my bottles. I had finished my bottle of Perpetuem as well as a bottle of water at this point. The volunteers at this stop seemed to be overwhelmed and it was more of a self serve stop. I got three bottles of water and got my bike all loaded, my Perpetuem mixed in one and was good to go. I quickly walked my bike over to the Porta-Pottys and didn’t have to wait for an open one, score! As soon as I got back on my bike, I had a pain on the right side of my stomach. It was a really intense pain and I spent the next few miles debating about which side my appendix was on because surely it was bursting. These miles also happened to be the climb of the loop. I spent about 15 miles dealing with this “my appendix is bursting” pain, unable to get down into aero, sitting up as much as possible. The pain eventually went away and I’ve since decided it must have just been a wicked side-ache, though I’ve never gotten one on a bike before. So those miles slowed me down more than I planned but I kept on going. When I made it into Hygiene where my husband and son were, I stopped to say hi and to let them know what was going on. I told him to let the rest of my cheer crew know so that everyone could adjust the times they were expecting me. Shortly after the pain went away and I got back to riding. I continued to take in nutrition at regular intervals, keep my effort in check knowing I had a long day and just remind myself to keep enjoying the experience. By the time I got to Loop 3 I was feeling pretty good about how the bike was going, though I wouldn’t get to see my family any on this loop. My side pain had gone away, I had kept up with nutrition and I was feeling good about where my time was. Loop 3 had a surprise hill for me. When we were driving the course on Friday we took a wrong turn and missed a small section of the course, which didn’t seem like a big deal. I’d read lots about the climb on Lookout Road and knew what that had in store for me. What I didn’t plan on was the climb going to Lookout Road! It went on forever and it was steep. And hot. Maybe I was just whiny by this point! Regardless, I made it up, kept my effort easy and passed quite a few people going up it. I decided to skip the aid station after that hill, I still had plenty of water and Perpetuem so I just kept going. Lookout Road was another climb, but was more doable for me than the surprise one. The views at this point in the course were amazing. 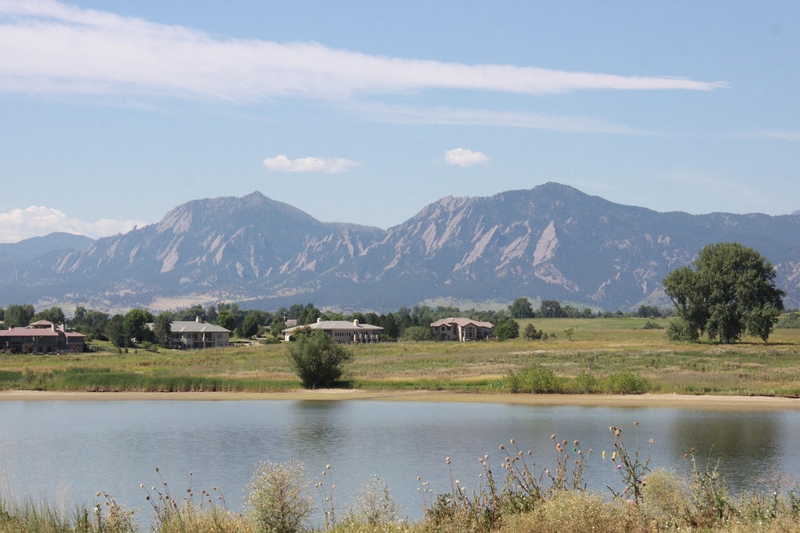 It was really neat to be able to see out past the Flatirons and see snow-capped mountains. By this point I was doing math in my head and knew I was going to be close to the 7 hour mark for the bike. Even though I was really looking forward to stopping for Skratch Labs sno-cones at the top of that climb, I decided to skip. 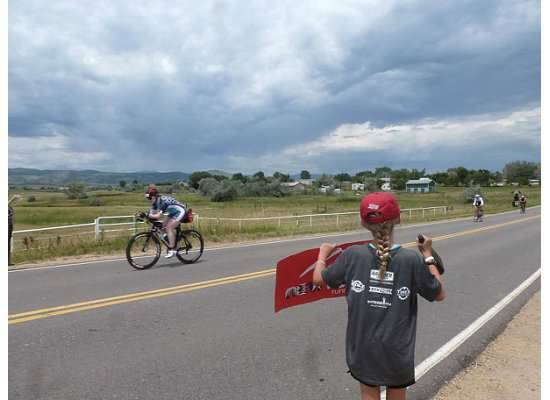 I really wanted to be under 7 hours for the bike if possible and if I was that close and a sno-cone made me miss it, I thought I would regret it. The ride back to town was uneventful, I was just focusing on maintaining my effort and speed and looking forward to being done with the bike. Nutrition- Hammer Perpetuem , Hammer Gel-Montana Huckleberry Flavor, Anti-Fatigue Caps, Endurolytes Extreme Caps, Endurance Amino Acids. Much like my nutrition at Legend 100, I used my watch’s 5 mile notifications as a reminder to take nutrition. One five mile beep I would drink Perpetuem, one five mile beep a gel and one five mile beep the capsules. T2- AKA longest transition ever. I’ve seen that this transition was over 1/4 of a mile long. In hindsight I could have rushed transitions more than I did this day, but I didn’t. I was happy to be in T2, but the portion where we walked our bikes to the track went on forever. When I finally reached the bike catchers I told my volunteer jokingly that I would be ok with not seeing my bike again. Picked up my bags and headed to the change tent. My volunteer in the change tent was a little more timid than I expected and watched and waited for me to say I needed any thing. I opted to change into running shorts here and was pretty glad I did. My bike shorts weren’t bothering me that I had noticed, but changing into non-sweaty shorts did feel good at this point. 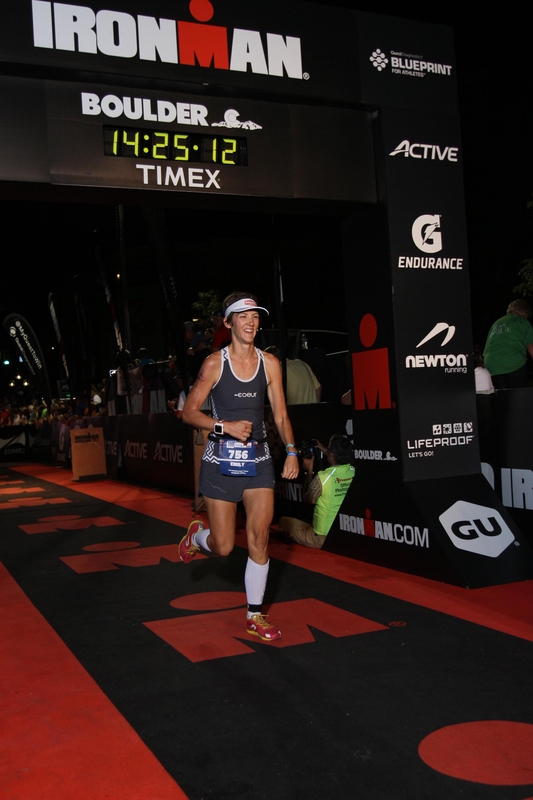 After another porta potty stop and hitting the sunscreen station once again, I was finally out of T2. 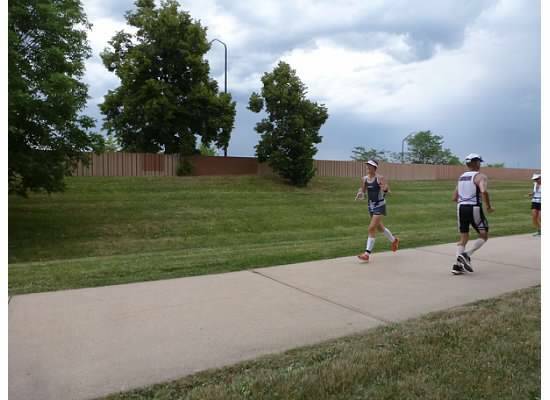 The run course was entirely on a bike path that goes through downtown Boulder. It is shaped like a Y and at each point you do an out and back. You do the whole thing twice. What this means is that there are always tons of people around, both runners and spectators. I slogged through the first couple miles, happy to be off the bike, but having a hard time finding a rhythm on the run. My legs felt great, but my energy level was just not there. At about the 3 mile mark my coach had caught up to me, he was an entire loop of the run course ahead of me, so was at mile 16 or so when we saw each other. We chatted for awhile and I told him to go run his own race, but still got to see him a few more times out on the course. At the 4 mile mark I stopped to chat with my parents for a little bit. 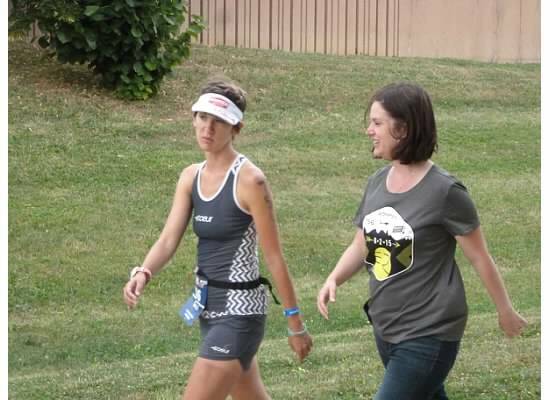 I was carrying all of my run nutrition with me and it was driving me crazy bouncing under my race belt so I dropped some of the excess off with my mom until I would see her on the second loop. My energy level was still low but I was trying to take in nutrition and get calories in to help get me going. Stopping to see my parents in the early part of the run. Proof that I was running at some point! 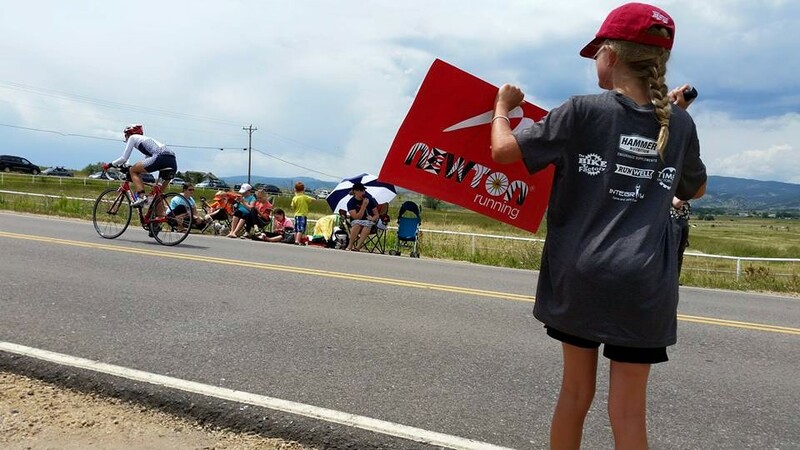 My husband and kids were working an aid station on the run course. I would see them at mile 10, 13, and 23 roughly. 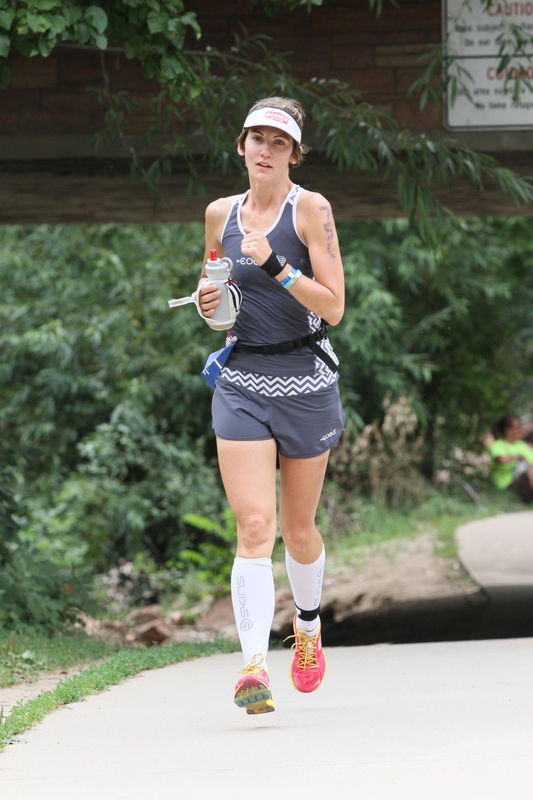 By the time I got to them at mile 10 I was feeling pretty discouraged. I was running a decent amount, walking when I needed to, but not feeling good and not enjoying the experience at all. A couple of volunteers and spectators had called me out on not even smiling at them before this point. My husband encouraged me to keep going and said I was halfway. I quickly corrected him that I still had 3 miles to go to be halfway. Eventually I got going again and continued to battle through running, walking, hating life. This was a low point in the race for me. As I continued this battle, I had a harder time running. My legs were fine, but my energy levels were low and I was feeling pretty dizzy each time I ran. 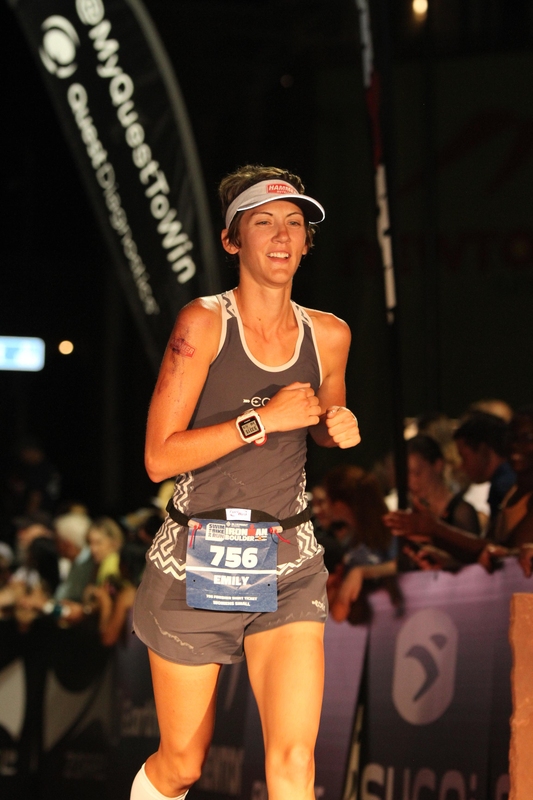 Eventually I decided that I was concerned about passing out and being pulled off the course. My stomach was also very unhappy with me at this point, I had thrown up and was having a hard time keeping anything down. I made the decision to just walk for awhile and I would run again when I felt able. I bargained with myself that if I was only walking, it had to be a fast walk. I channeled my inner mall walker and began walking exclusively at about mile 15 (I think…) I reached my parents and sister again at mile 17 and they offered encouragement. My sister walked alongside me for a minute and we just chatted and she took my mind off of everything. As I continued along the course, tons of people were walking. Some were doing a combination of running and walking, some were just walking. Quite a few people commented to me that I was a really fast walker and I continued to catch them even with their run/walk method. I glanced down at my watch as it beeped at the mile markers and I was staying in the high 13 minute miles for my pace. I was ok with that given that I was walking the entire thing. Along the way I encouraged a few people to mall-walk with me and had company for parts of it but they eventually dropped back to a slower pace. The great thing about walking this part of the race is it allowed me to not hate life. 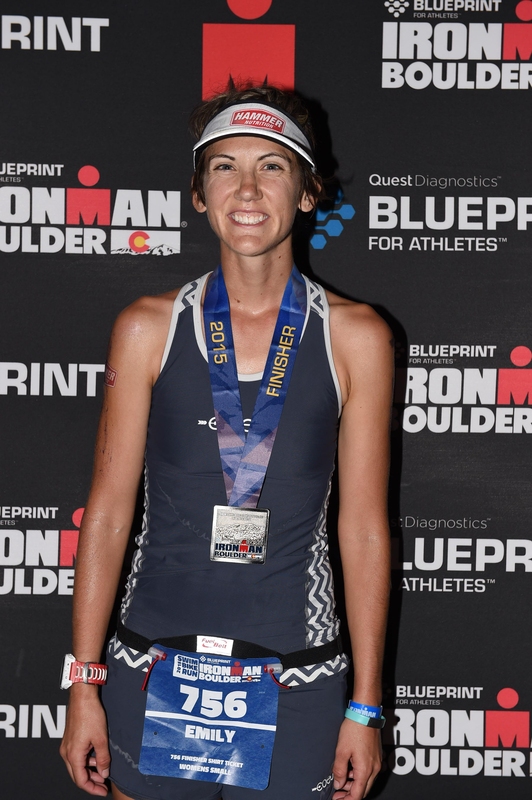 Even though I knew with each slower mile my time goal was slipping away, I was able to enjoy the experience of my first ironman, I was able to encourage others out there suffering with me, I was able to thank the volunteers. When I reached my husband and kids for the last time, I only had a few miles to go. Their shift was over they had just stayed to help longer, I encouraged them to head out so they could see me at the finish line. I tried to run a bit after that aid station but again felt really dizzy. I kept speed walking my way through the last out and back section of the course. Once I passed mile 25 it was officially dark out and I knew I was close. I began to run when I could, walk when I could. As I left the creek path to head for the final portion of the race I made myself run the whole thing. No way could I let the finish line experience be walking. The finish line chute was just as cool as you imagine. I had read advice saying to take it all in, give high fives and make sure you’re the only one in your picture. More and more people were showing up around me so I couldn’t decide whether to speed up or slow down to get my own finish line experience. 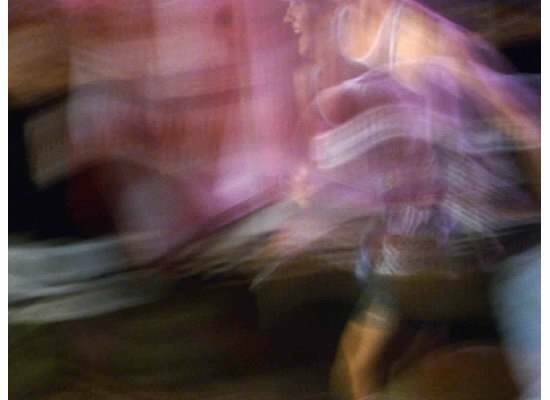 When I slowed, people just seemed to keep coming so eventually I just picked a pace and went for it. At first just kids were out offering high fives, then as I got further into the chute the excitement and energy level of everyone around grew. My husband was able to get up to the barrier at just the right time and yell at me for a high five, that was an amazing moment. 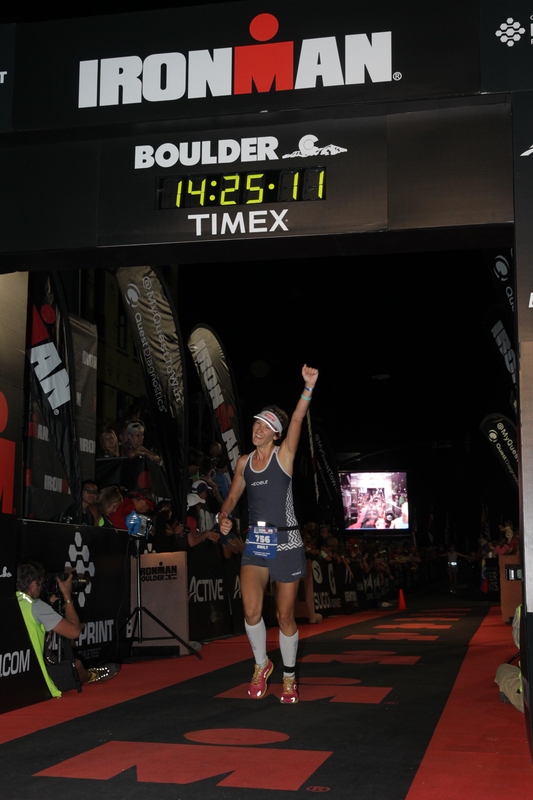 As I crossed the finish line I was really happy to be done and have had such a great experience. NUTRITION- Hammer Heed, Hammer Gel (Peanut Butter Chocolate), Anti-Fatigue Caps, Endurolytes Extreme Caps, Endurance Amino Acids. Added in from the aid stations were pretzels, potato chips, grapes and Coke. A volunteer helped me navigate through the post-race area getting my medal, picture, food, hat, shirt. I then found my family and got to celebrate. I felt pretty good post race, very tired but able to move. I didn’t even attempt to eat until later that night when I was back at the hotel. My family and I hung around the downtown area for awhile, chatting about the day, taking pictures, resting up a bit before the walk to the car. I was tired, my cheer crew was tired, we opted to head back to the hotels instead of staying for the midnight finish line experience. Maybe someday. Not a great picture, but the only one we have of all of us from that night. 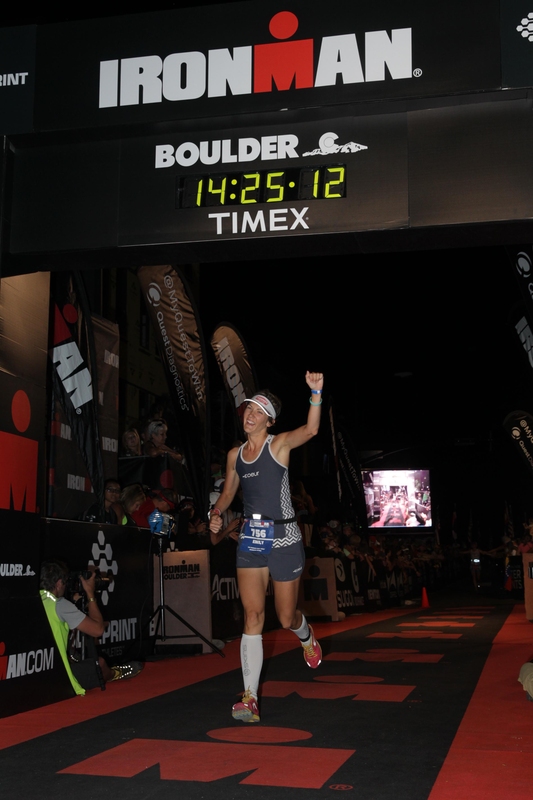 My first IM experience was amazing and I really enjoyed the day. I’ll have a follow-up post on things I could improve on as well as what happens next. Thanks for reading! 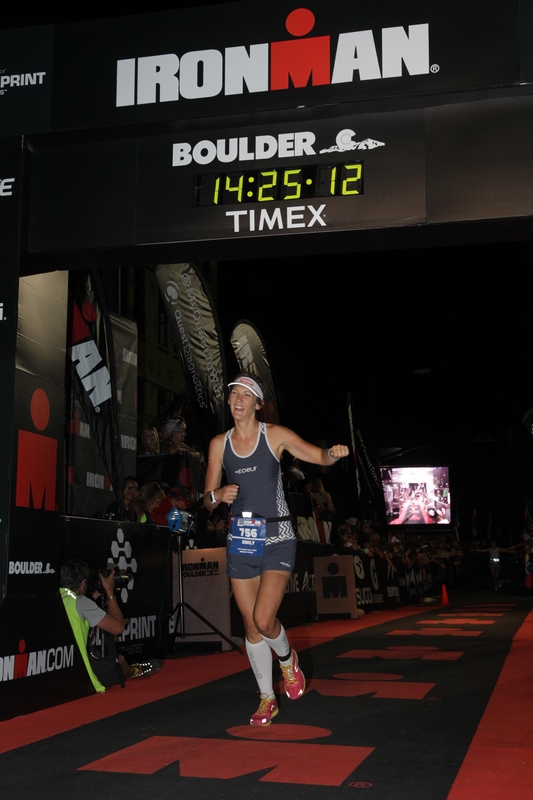 IM Boulder is over, time to head home! 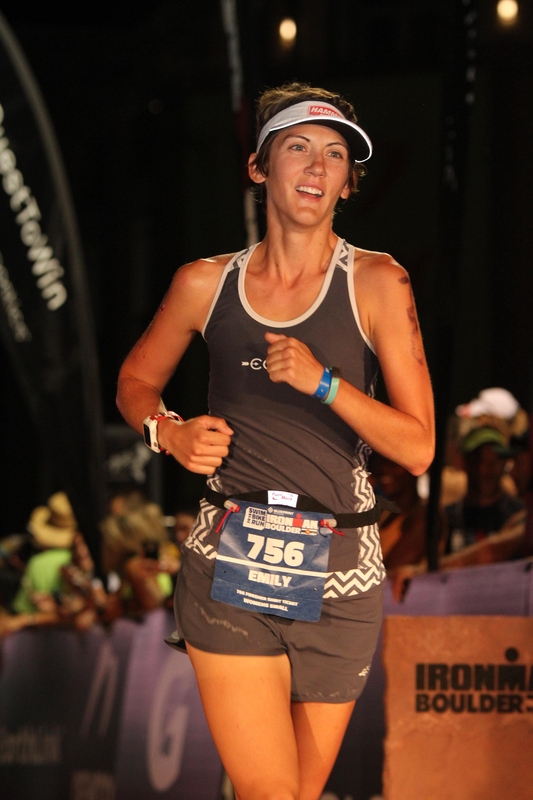 I still need to do my actual race report, but until then, I’ll just share my pictures from the day. 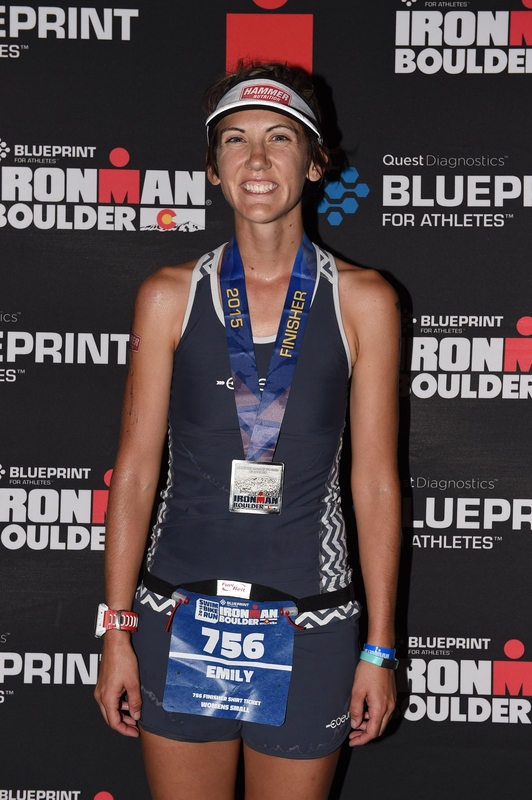 I usually don’t buy official pictures from races, but hey it’s my first Ironman, I can justify the crazy prices, right!?!? IM Boulder was such a neat experience for me. 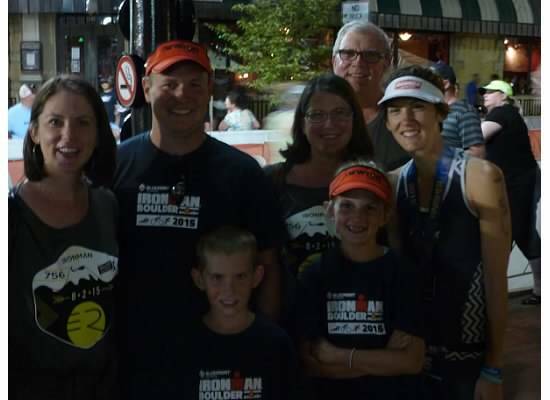 Not only was it my first IM to participate in, I’d never even been to an Ironman branded race before. 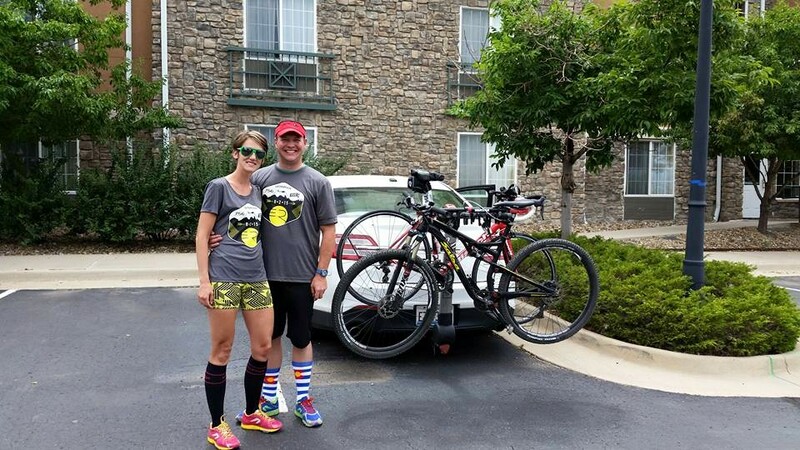 After a week’s vacation in southern Colorado, we headed to Boulder for a weekend of Ironman fun. wild mushroom medley, greens, asparagus, tomato, eggplant, thai peanut sauce, on rice. It was healthy, it had spice, it was so good. 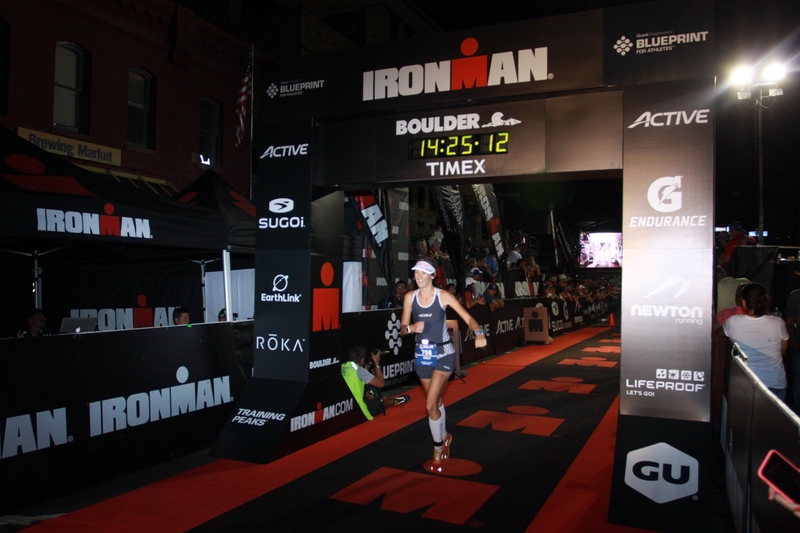 After that we headed over to Ironman Village at Boulder High School. 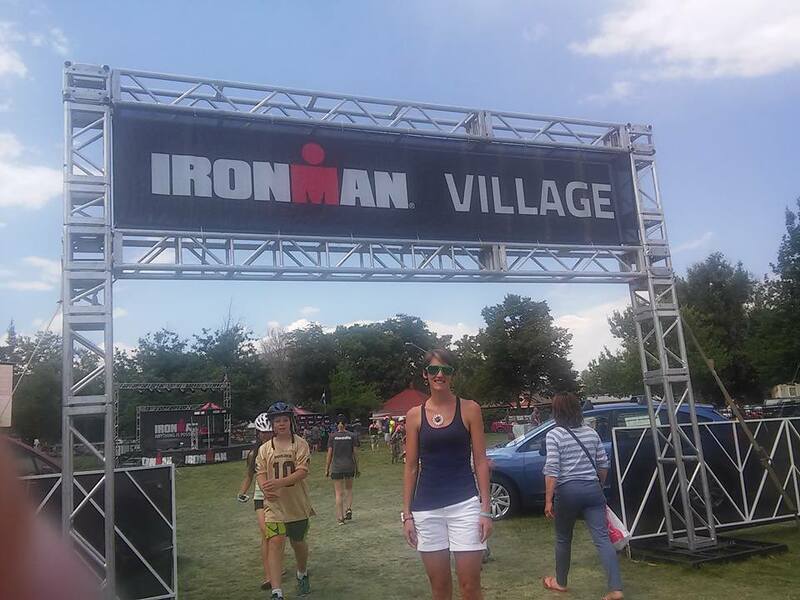 We perused the expo, completed athlete check-in and just took in the Ironman experience. 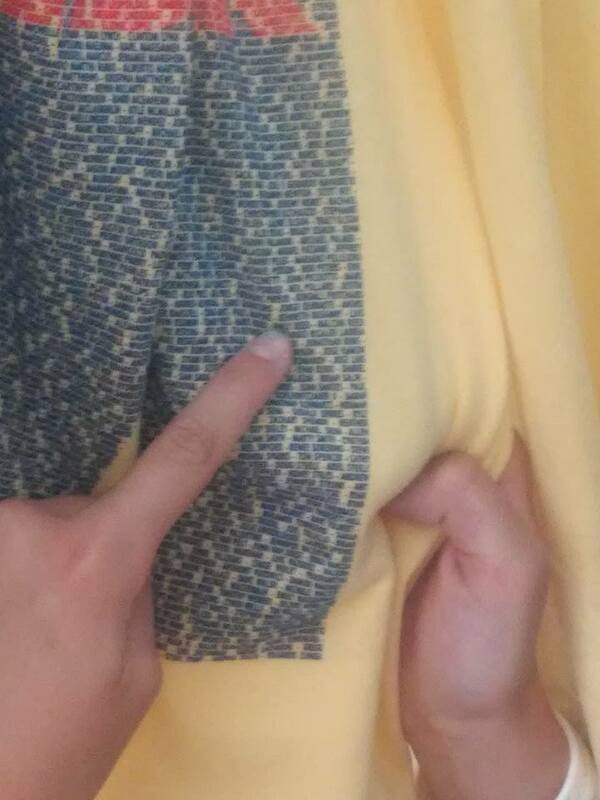 Finding my name on the shirts with all the participants. Ready or not, IM Boulder is here! From there we checked into our hotel and went out to drive the bike course. 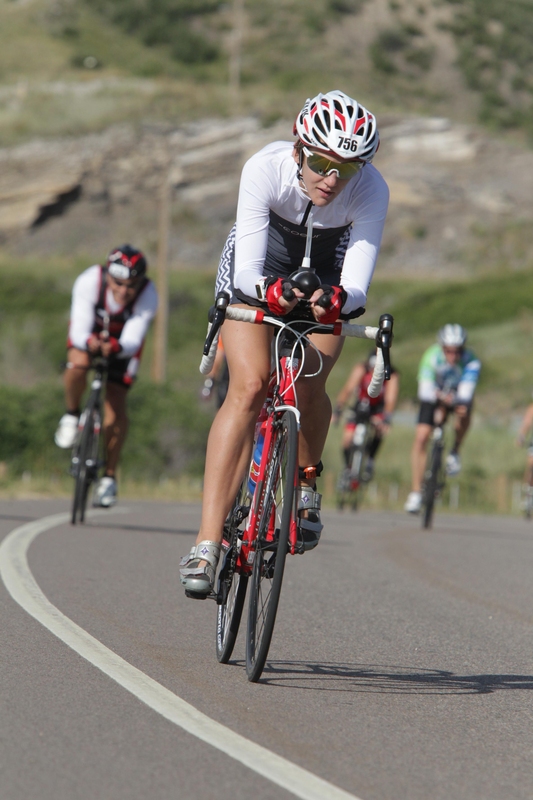 In the weeks leading up to the race, I’d seen various accounts of the bike course and was anxious to see for myself. Driving the course did a lot to calm my nerves. The hills at Legend 100 in Kansas seemed far more intimidating. Also along the stop, we went to Mary’s Market in Hygiene. It’s a cute little market that was right along the course that we decided would be perfect for spectating. This was another thing I really loved about Boulder. This market truly caters to cyclists: from the bike racks in the yard to the quick portable healthy snacks to the Scratch Labs fountain drinks. Why don’t more places do things like this? There are so many people trying to lead more active lifestyles, if more markets and convenience stores could support that I think they would see increased business. Friday night we met my parents and sister for another great dinner, then enjoyed the Pearl Street Mall. In downtown Boulder, they have a few blocks in the middle of the city that are closed to traffic. Filled with shops, people and street entertainers, there was plenty there to keep us busy. 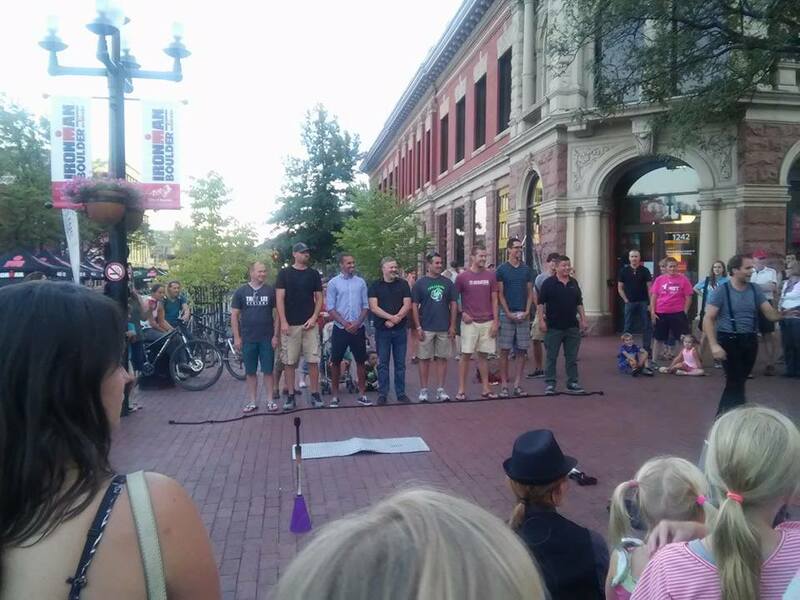 My husband got pulled in as a volunteer with one of the street performers. 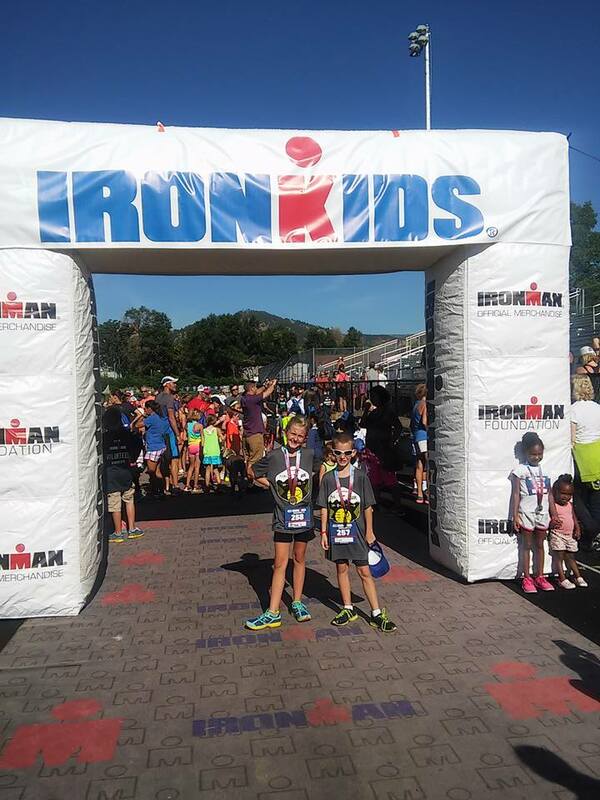 Saturday morning was the Ironkids race. All week month long, my kids had been arguing about who was going to win this mile race between the two of them. After a 4 mile fun-run at the beginning of the month, it was apparent that their running paces were getting faster and were pretty close to one another. 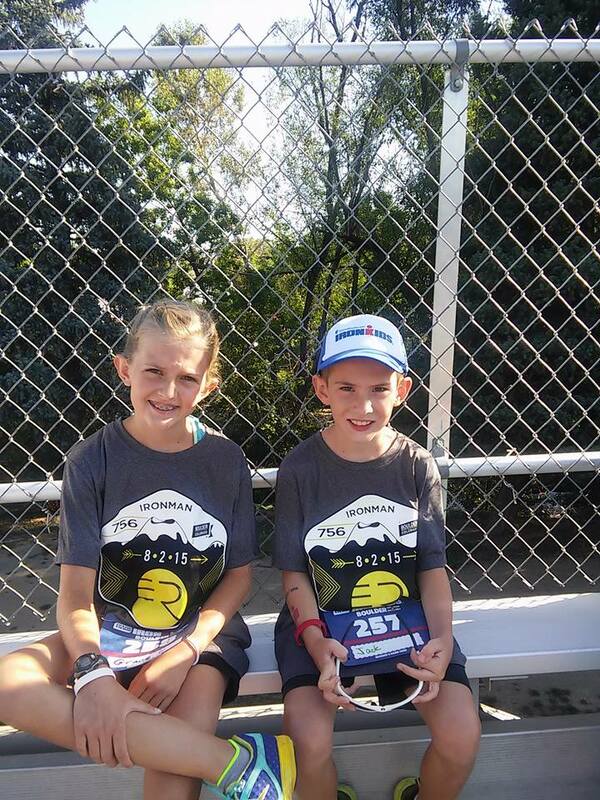 The youngest kids ran first in a .25 mile race. It was completely adorable, some kids barely able to walk being helped along by their parents. Next it was time for the older kids to run a mile. Two of the sports greatest athletes were on hand to encourage the kids, help them warm up and even award their medals at the end. The pros warming the kids up. My son is in the front row with the blue hat on. 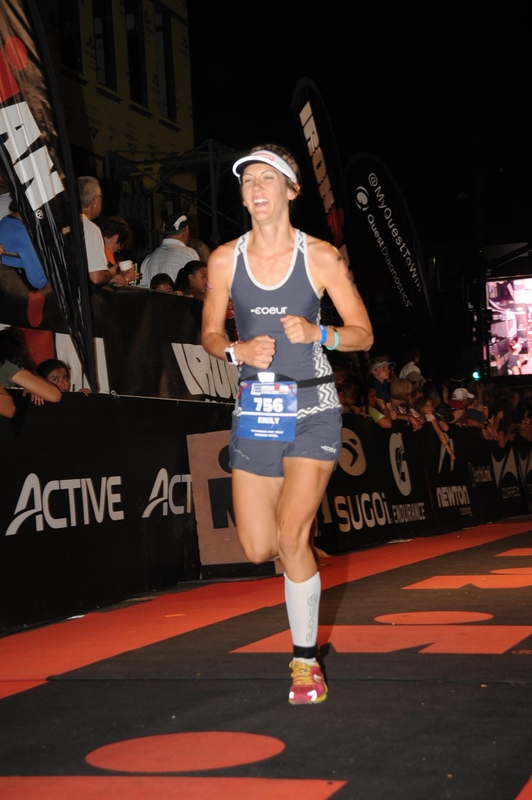 We had watched the Kona broadcast on tv, so my kids had seen Marinda Carfrae before, but didn’t know as much about Amanda Stevens. My takeaway was how humble, kind and inspriring they both were. And like I told my kids, how many other sports can you say you’ve met a world champion in!?!? 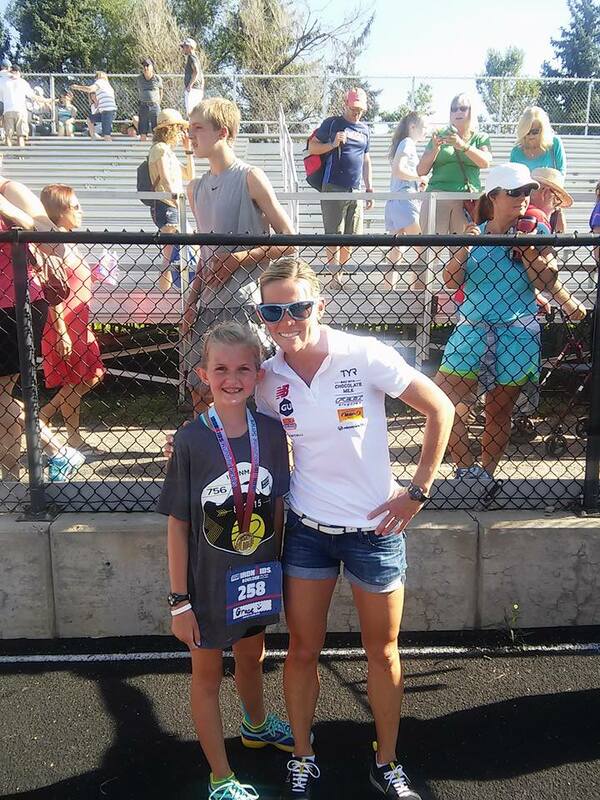 Grace with World Champ Marinda Carfrae. 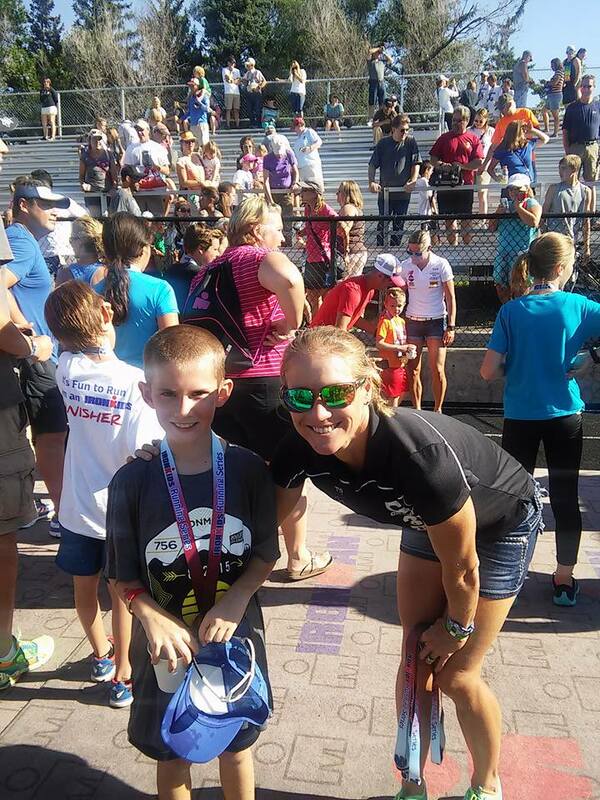 Jack with pro Amanda Stevens. Though my kids were excited about meeting them, I had my own fangirl moment as well. 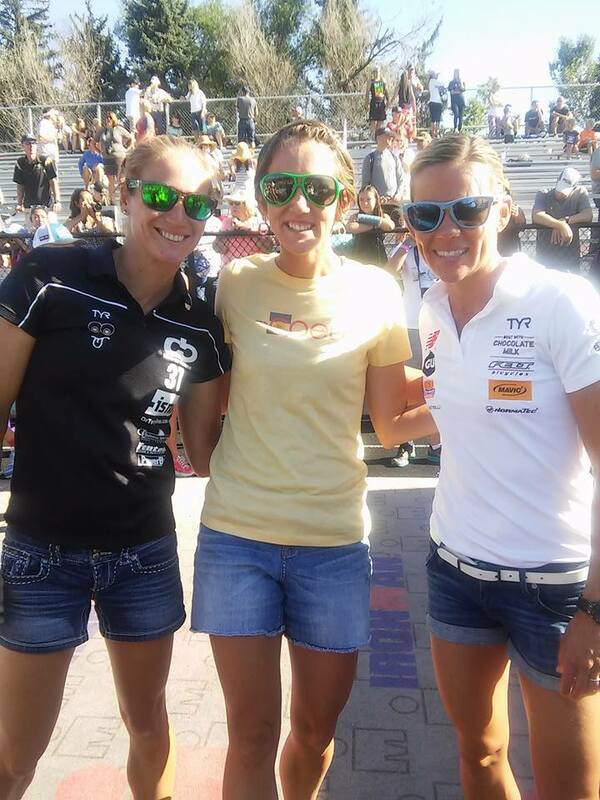 Me with two of the best in the sport, Amanda Stevens and Marinda Carfrae. 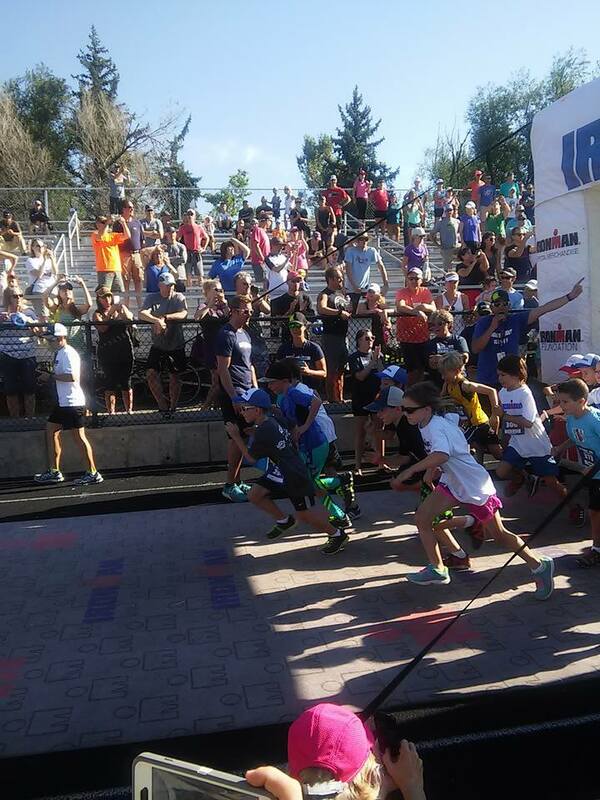 Although the fangirl moments were fun, the real point of the day was the kids race. 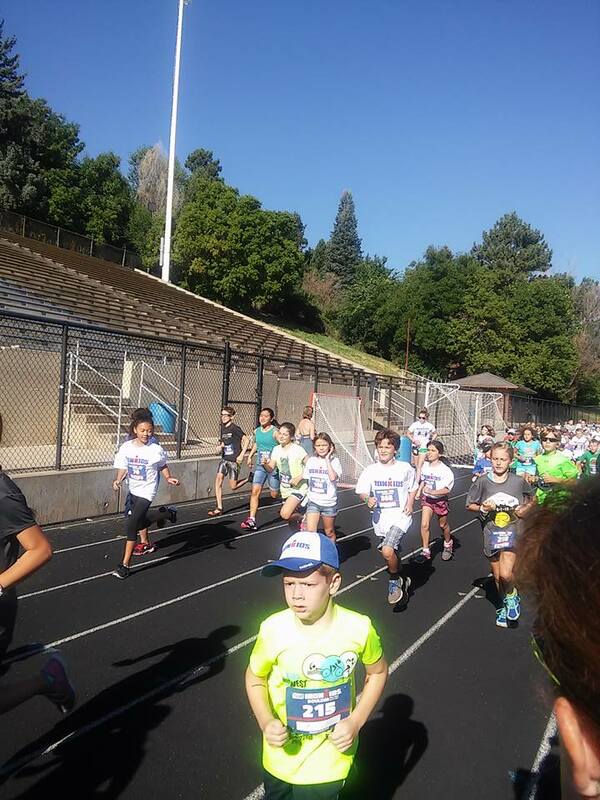 My son, age 9, had worked his was to the front of a very large crowd, toeing the starting line ahead of his sister. He loves to take off fast and see how long he can hold on, while my daughter prefers to pass people as she goes. 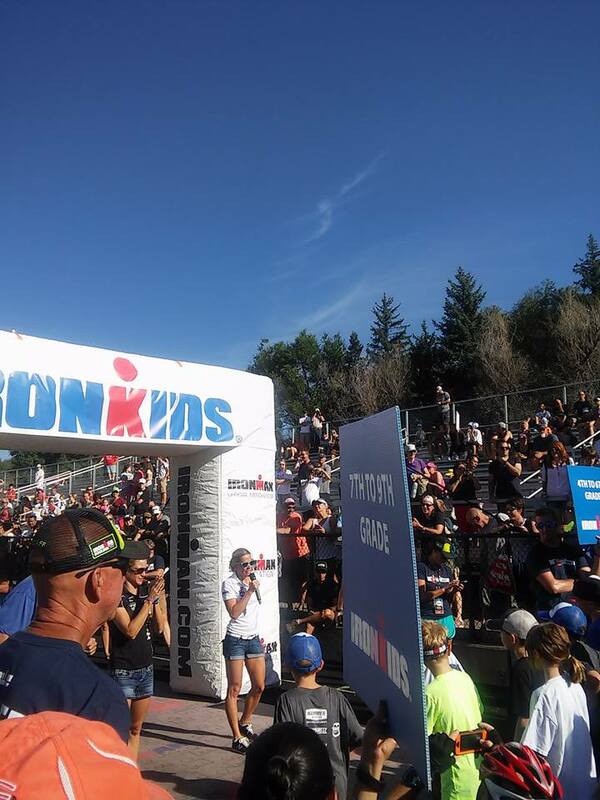 The starting line of Ironkids. Jack on the other side of the track, still pretty close to the front. Grace on the other side of the track, in a much bigger crowd of kids. 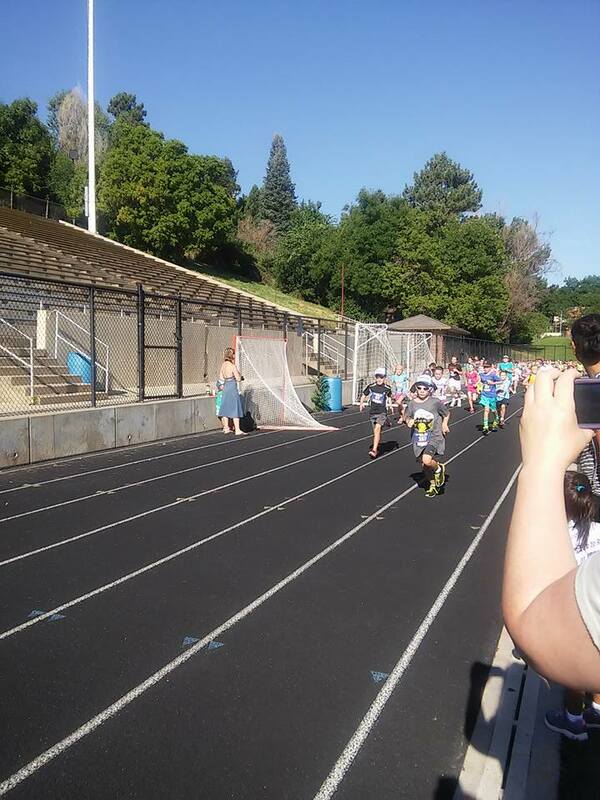 After this, the course left the track and we couldn’t see the progress until they returned to the track for the final 100 m. Myself, along with all the other anxious parents waited, hoping to catch a picture of their kids as they ran by to the finish. 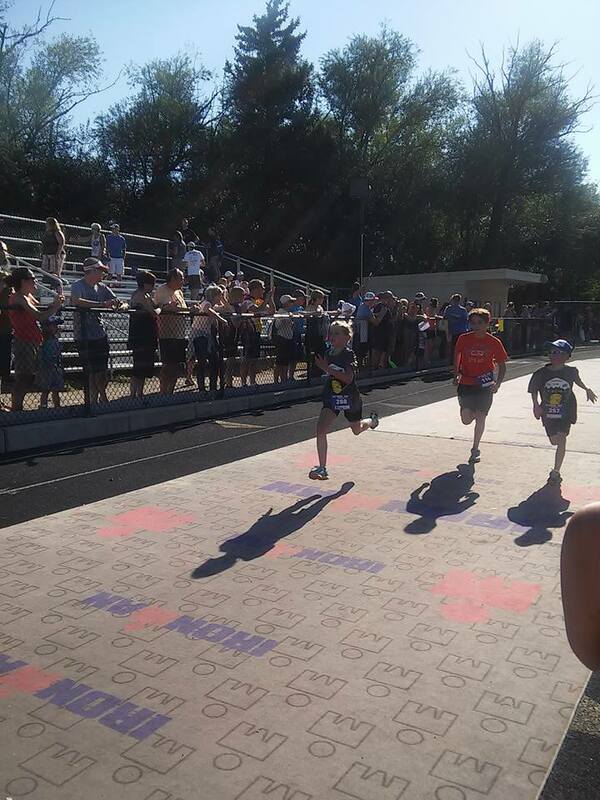 Out of the huge number of kids, I was shocked when I saw both of my grey shirts racing one another at the end. It was a very close race, they were within a couple seconds of one another and both ran their fastest mile ever that day. We were all so proud of them. The rest of Saturday was spent preparing all of my bags and dropping them off at the appropriate locations. It seems like that shouldn’t take that much time. 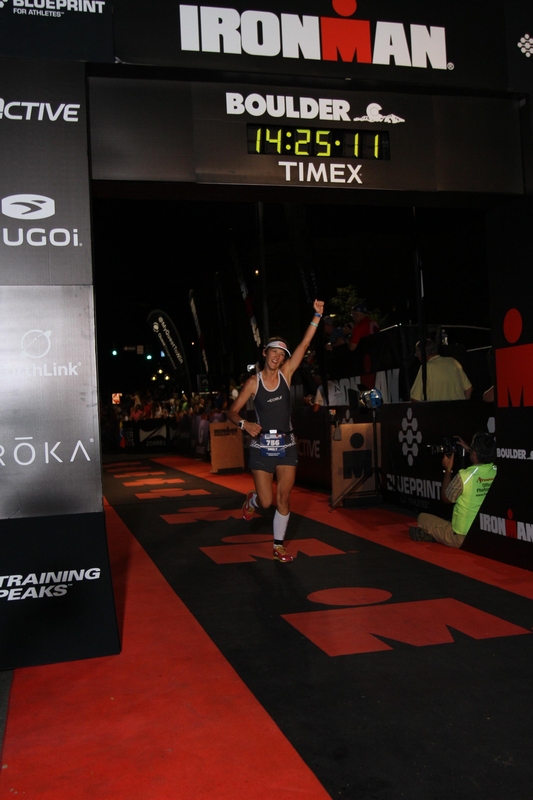 I was amazed how it was truly an Ironman weekend and took a very good part of the day Saturday. Word to the wise, make sure you start this process early, it will take longer than you expect. 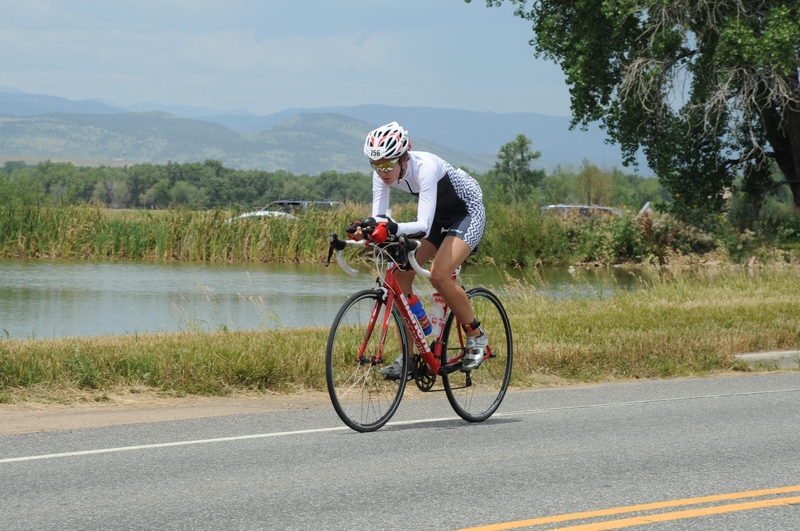 The bike drop-off was out of town at the Boulder Reservoir. It included a very long walk. Had I realized this, I would not have worn flip flops. As we waited until the heat of the afternoon, we were all a little crabby through this process, it was a long, hot walk. 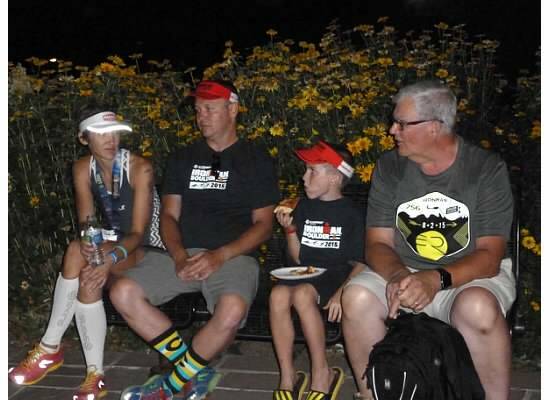 After that we headed back into town where my family attended a meeting that day as they were volunteering on the run course at an aid station the next day and I dropped off my run bag at the High School track, again a pretty long walk. Saturday was capped off with a pasta dinner and what should have been an early bed time, but the nerves and excitement kept me up til probably 10:30. Next up, race day!! !